The only way to tell male from female blue jays apart from one another is to observe their behavior. You can distinguish males from females by seeing which birds court the other birds (the males court the females), and which birds brood the eggs (the female will incubate the eggs). Blue jays are beautiful birds that inhabit the eastern and central parts of the United States, known for their bright blue feathers and the crest on their head. Yet as striking as blue jays are, it’s difficult to tell female blue jays apart from male blue jays. How can you discern the difference between the two sexes of blue jays? In order to learn how you can identify the females and males of the series, it would be helpful to know a little about the general behavior and characteristics of blue jays. Has a wide habitat range including: gardens, groves, deciduous woods, and towns. Omnivorous, but prefers nuts, grains, and berries. Blue jays may be divided into four or more subspecies, depending upon how they are classified. 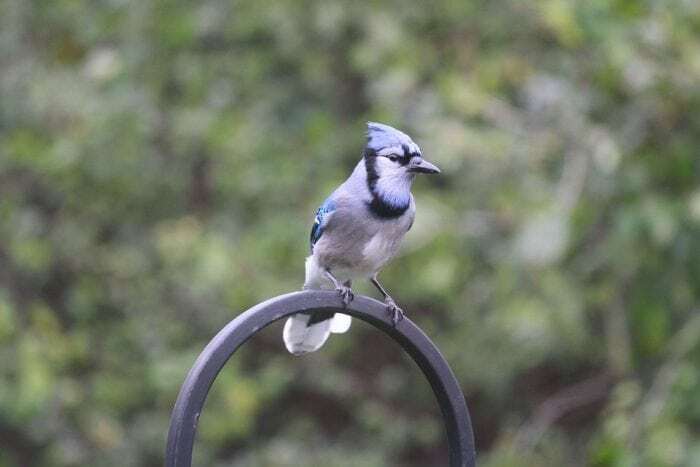 Commonly recognized subspecies of blue jays include the Northern Blue Jay, the Interior Blue Jay, the Florida Blue Jay, and the Coastal Blue Jay. Blue jays are small-to-medium sized birds, being around 9 to 12 inches (21 to 30 centimeters) in length and weighing somewhere between 13 to 17 inches (34 – 43 inches). The blue jay has a noticeable crown on its head, a crest covered in feathers. These feathers change in position as the bird’s disposition changes. 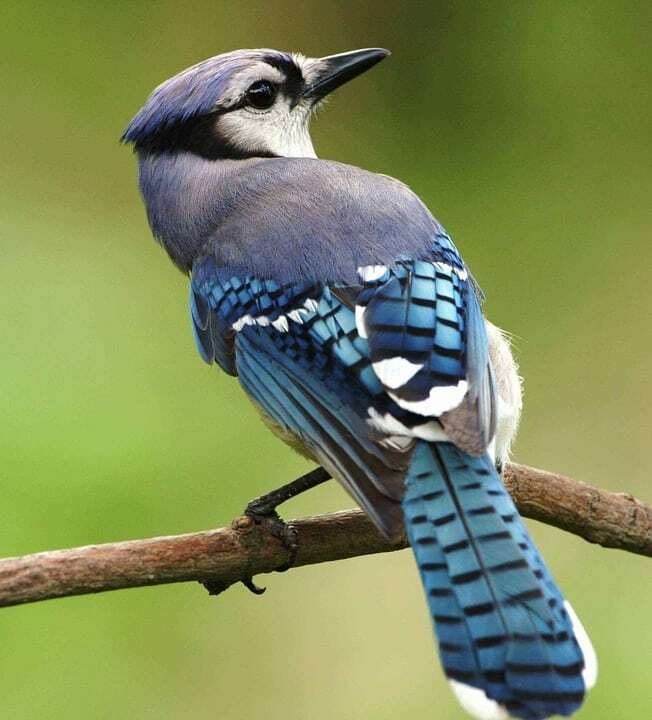 When a blue jay is frightened the feathers on its head will bristle, the crest will be raised when excited, and lowered when the bird is resting or among other blue jays. Blue jays are known for the striking blue color of the feathers on their back, which results from the structure of their feathers. Their feathers trap certain wavelengths of light and reflect others due to their structure, and this interference makes them appear blue. This is known as structural coloration. The underside and face of the bird are usually white. The blue jay can be found throughout the eastern half of the United States, as well as in some parts of Texas and Canada. The western edge of the blue jay’s range runs through the Great Plains states. Blue jays that live in the northern part of the US, as well as Canada, may migrate during the winter to warmer southern climates. 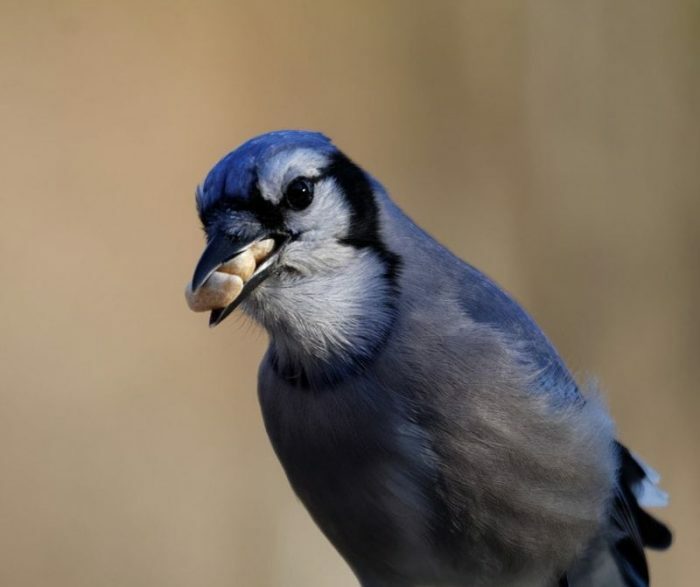 Blue jays subsist on a variety of different meals. Their beaks are built mainly for eating nuts and seeds, and things like acorns are favored meals. They’ll also readily eat things like grain, fruit, and berries. Blue jays are omnivorous, so when they get the chance they’ll also eat insects like grasshoppers, beetles, caterpillars, and spiders. As noted above, blue jays can be rather aggressive, a habit they share with other birds like starlings. They’re also quite intelligent, often working together and coordinating with one another to drive off competition or to scare off possible predators. Blue jays have complex relationships with other species of birds because of their nature. They frequently drive off other species of birds, trying to defend its territory. They’re sometimes considered pests by those who would prefer to see a greater variety of birds in their backyard. On the other hand, blue jays may chase away larger predators, making the area safer for other species of small birds. Blue jays are curious birds that display a fascination with shiny objects, things like coins or bottle caps, sometimes stealing them and playing around with them. Unlike some other birds, male and female blue jays usually form mating pairs that bond for life. One of the primary ways of identifying a female blue jay from a male blue jay is watching how the bird behaves during courtship. Blue jays usually congregate in groups of around three to ten individuals. The female leads the group, and if she flys somewhere, the male birds follow her. After the female lands, she will simply observe the others, while the male of the birds will notably bob their heads up and down to try and capture the attention of the female. The mating season for blue jays starts around the middle of March and can run until July. Female blue jays typically lay a clutch of between three to eight eggs, with an average of four or five eggs. These eggs will hatch after a few weeks. Another way of distinguishing female and male blue jays is to watch them build a nest. Though females and males often build practice nests together, the breeding takes the lead in building the breeding nest. The female also does the vast majority of egg incubation, while the male brings her food. The young birds are capable of flying after about 18 to 21 days, though they will still stick beside their parents learning from them until the early fall when the young birds will disperse and strike off on their own. Male and female blue jays look very similar to one another, so the best way to distinguish them is by their behavior. Look for the female leading the group around, the male birds following her and bobbing their heads to get her attention. After the nest is built, the female will be incubating the eggs, while the male brings her food.